I make my own chocolates and candies every year for Christmas and Easter. This book looks like it has some great new ideas. Yes please! Everything looks so good, and I'm always up for trying new recipes. I have such a weakness for candy, I would make great use of this book! this looks like such a fun cookbook. we love making homemade sweet treats at my house. That looks absolutely divine!!! Love to have it. Beautiful pictures! They make creating candy doable. My husband loves when I make him treats so I'm always looking for new recipes. This would be perfect! sooo pretty! i would love to win a copy! This looks like a book a gal need to have in her cookbook arsenal! Would love to win it! This looks fantastic! Would love to try these :) Thanks so much! OOooOO Yum! My hubby would love these treats! Thanks for the chance to win this book! I LOVE making candy...this book would be great!!! Oh yum. This looks so great! You had me at 'sweet'. Oh my goodness! This looks delightful. Oh YUM! I hope I win! I think I've gained 10 lbs. just by looking. Oh well... It was worth it! This would be amazing to win. All the treats look so tasty! Thanks! That book looks amazing! Thanks so much for the chance to win a copy! looks like a great book! i love pictures in recipe books. Oh my!! This looks awesome... I agree, I'd love to consume most of those goodies. Like, immediately. everything looks sooooo good!!!! Would love to win!!!! Makes me hungry for some yummy candy just looking at it! I would LOVE this book! These candies remind me of my Grandma's sweet treats she'd used to make during the Christmas season. Yum! Just what I need....oh losing weight, how I hate you! Yummmm! Looks like a tasty book! Wow, the book is beautiful. I love it but I think My sister-in-law would die over it! Hope to win! Such lovely photography. I want to eat one of those coconut shells right now! I need a sugar rush!!! Oh, how this book is just calling my name! I LOVE sweet things, really, it must be some sort of disorder. I do LOVE pretty food photos! Thanks for the giveway! I would love to make everything in this book and eat it too! I want to try every recipe! Wow! The treats looks so delicious! What a beautiful book! I would love to win; what a fabulous opportunity! Thank you. kbajja@msn.com I hope I win! These treats look so delicious and the book looks really beautiful! This book looks a little dangerous!! Sounds Yummilicous! PICK ME PICK ME! looks so yummy! so long new years diet! I would love to make the fudge and caramel recipes they sound delicious. I could definitely pile up a few sweet recipes before I have second little one in June. Thank you for this opportunity i’ve just discovered your blog in the past week and enjoy it a lot. Great looking desserts! This would be a great give away to win! Thanks so much! I'd love to win this - I seem to have problems whenever I have to coat treats with melted chocolate. Maybe this could help me! oh. my. how lovely do those sweet treats look?! pick me!!! Just looking at the book makes me want to devour it! HAHA! Wow, The photography in this book totally reminds me of your clean bright style. I can see why you love it. .. I would love to win one! And there goes my new years resolution... I like to eat!! Treats even better! wow, this book would be awesome to check out just for the pictures! would love to get my hands of a free copy! I would love a copy! I love making sweets. Oh man, that book looks scrumptious! This would totally be the best for my hubby. He loves candy, and even better when it's homemade! How fun! I need to tackle marshmallows again. And those dot candies look adorable. There's so much I want to try just in this little preview. torigreene at yahoo dot com. I would love to try making these! I love making sweets like these!! Wow. Yum. You had me at truffle. LOVE treats! What a great book. What a great giveaway. Fabulous! Thanks. I'm pretty sure i NEED this book. RIGHT. NOW. Mmmm it all looks so yummy. I think my little boy and I would put this book to great use! Just the pictures made my mouth water....I can't imagine what the actual confections can do! I want to eat this book. For serious. What a beautiful book! This would be a fabulous resource for goody making for family and friends. oh my husband,with the sweet tooth, would LOVE this book. This looks terrible and wonderful all at the same time! YUM! Thanks Dana! Would love to try out some recipes! They look so yummy. Thank you! oh my heck!!! would so love to win this book! such amazing pics my mouth is watering just looking at them. I crave sweets so much when I am pregnant, which is the case right now :)) I need this book!!! This looks awesome (well except for it ruining my diet), I would love to win a copy! Thanks Dana for another awesome Giveaway! I'm buying this book I don't win it! Looks like SO much fun! Thanks for sharing! Ohhhh yummy! 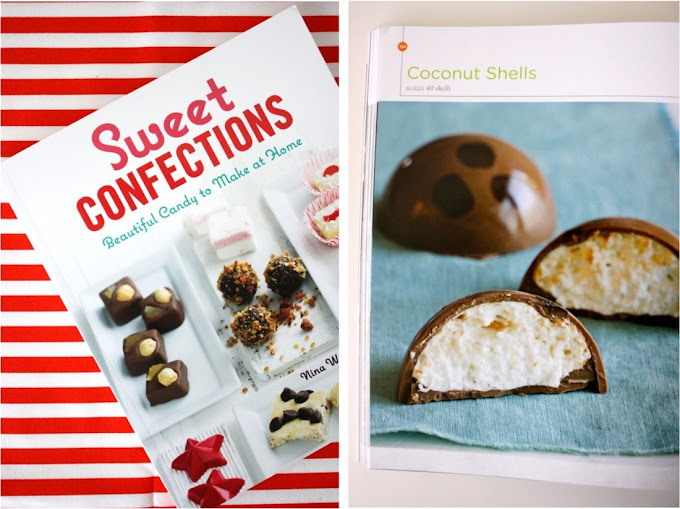 I have a serious sweet tooth and this book looks delicious! Those look so yummy! Thanks for the giveaway! I love looking at food pictures almost as much as I enjoy making and eating the recipe! All of the things in that book look soo yummy! I hope I win! I hope I WIN! Mmmmm all the treats look SO good!!! Yum yum yum. Finally candy that looks easy to make! 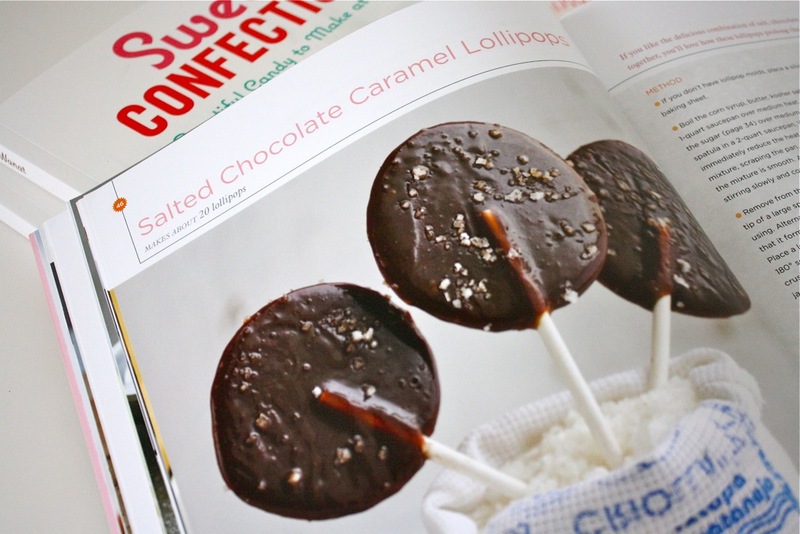 My mouth is watering at the picture of the salted caramel chocolate lollipops. YUM! 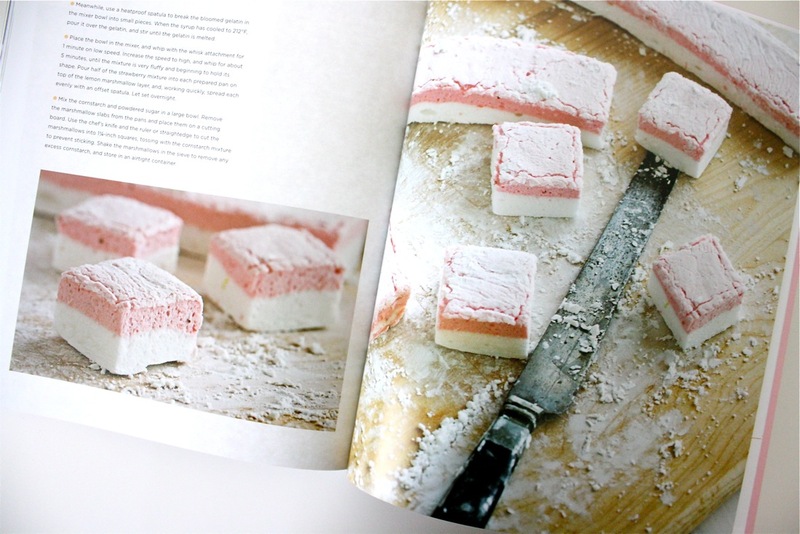 this book is a joy to the eyes and the sweet tooth! I'd love to win. It makes my mouth water just to look at your pics! this book looks wonderful!! I must admit that I have quite the cookbook library, but this one takes the cake! err lollipop :D! I love making your own homemade goodies...especially when others are always so amazed at simple things like making marshmallows! Oh my those marshmallows look so good. Yum - this book looks like a fun kitchen adventure - or several! Thanks for the giveaway, Dana! looks like a lot of fun - thanks for the chance to win! ooh every picture you posted looks amazing! This book is right up my alley! Resolutions? What resolutions! This looks fantastic. I love food photography. Yum! gkeschner AT gmail DOT com. Looks absolutely scrumptious! Here's hoping I win! OOh, I can't wait to give these a try! what a great way to spoil friends and family on Valentines Day. I NEED this book!!! I love to make sweets! Oh what fun! fingers crossed. This book looks absolutely fantastic! I can't imagine a single person who would NOT want that book!!! OMG!! Eeeps I hope I win! This book looks delicious! I would love to make all the yummy treats! I'm already in love with this book! The pictures are amazing. before, but would love to try with this book! This would be an awesome book to have for Christmas presents.....and a pregnant lady!! It looks like such a fun book! I'd love to try those recipes! Salted Chocolate Carmel Lollipops, what!? Im sold. I just gained 5 pounds dreaming about eating all those yummy treats. This book is going on my wishlist for sure. Yum, yum, yum- looks sooo good! This looks amazing, I love making and eating sweet! Mouthwateringly delicious! I can almost taste the chocolate just looking at the photos! I love to bake but haven't made much candy and would love to. Everything looks so good. I'm drooling... chocolate covered potato chips, yes please! So many yummy sweet treats! I think I just gained 10 lbs just looking at the photos! I'd love to own this book! I made some honey-orange marshmallows for Christmas this year and it was a blast (and yummy). Looks super yummy. Would love to make some treats.